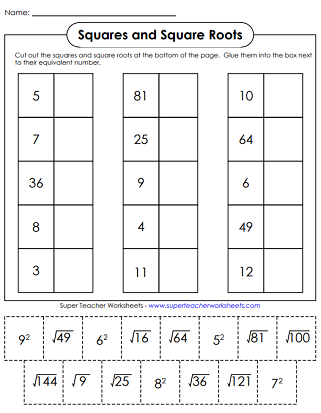 Use these worksheets to help students learn about exponents, squared numbers, and square roots. Worksheets with the common core icon align with the Common Core Standards. Cut out the squares and square roots and glue them next to their equivalent number. Color, cut, and fold this origami fortune teller (aka cootie catcher) game to review basic square roots. Determine the square or square root of each number shown. Here's another fortune teller game that requires players to find the squares of certain numbers. Color, cut, fold, and play! 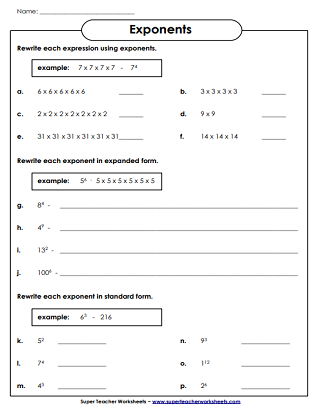 Write the exponents as numbers in expanded form and standard form. Compare the values of the exponents using the greater and less than symbols. 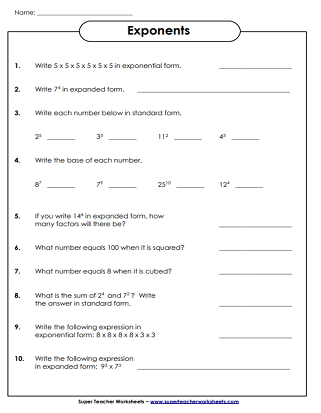 Answer the questions to demonstrate knowledge of exponents. Practice writing numbers in scientific notation.